Why didn’t Seeman oppose Kaththi? Finding reasons to ban a film and cooking up controversies are becoming regular affairs in Tamil cinema. Recently controversies about the producer of Kaththi, Lyca Productions, being involved in the Srilankan issue were doing rounds. He also refuted rumours about he doing a film for Lyca Prductions. Meanwhile AR Murugadoss’ Kaththi, starring Ilayathalapathy Vijay and Samantha, is nearing completion and is expected to be wrapped up by the end of this month. The team is looking at Diwali as a suitable time to release their film. Sathuranga Vettai's quarter century ! 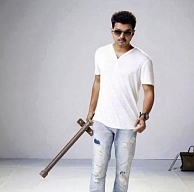 Will AR Murugadoss Directorial Kaththi Have Two Makeovers For Vijay ? What Is Shruti Haasan's Involvement In Kaththi? Kaththi Team Meets Political Leaders - Pazha Nedumaran, Thirumavalavan And Seeman ! People looking for online information on Ilayathalapathy Vijay, Kaththi, Seeman will find this news story useful.